Jewish artists have tended to take on elements of the societies in which the artists lived. Excerpted with permission from “The Arts in Judaism: The First 3,000 Years,” published in Contemplate: The International Journal of Cultural Jewish Thought. In the History of Jewish Art, Cecil Roth summarizes the research into the influence of synagogue art on Christian Church art and then on European art in general. Frescos such as those found in Dura Europos are seems to have exerted an influence on early church art, whose effect in turn is evident in most medieval art and thence in Renaissance art. Roth sees a parallel between the development of church music from synagogue music and the development of the figurative arts in the two religions. Betzalel Narkiss, who wrote and edited an expanded edition of the Roth History, perceived clear continuity in Jewish art from the Hellenistic-Byzantine period through to the Middle Ages and the Renaissance, a continuity in style, thematic motif (the Hand of God for instance) and in the treatment of the motifs. The same thematic and formal motifs from synagogues built around the middle of the first millennium C.E. reoccur in mahzorim (High Holiday prayer books), haggadot (Passover seder books), and ketubuot (Jewish wedding contracts) of the first centuries of the second millennium–i.e. 500 to 700 and more years later. From the beginning of the second millennium C.E., Jewish art in its Diasporas takes on ever more strongly the color of its host society’s art, both Muslim and Christian. Throughout the Islamic world, from Iraq and Yemen to Spain, Jews worked in the fields of letters, literature, and philosophy and, like their Muslim rulers (Iran excepted) almost totally shunned figurative arts. In Christian lands, Jews spoke and wrote in the local vernacular and their art–in illuminating mahzorim, haggadot, and ketubot, and other types of manuscripts–shows clearly the influence of their surrounding. Jews in the Islamic world almost totally shunned the figurative arts, drawing their authority from a strict reading of the Second Commandment [prohibiting “graven images”]. Those sections of Jewry that came under the sway of Kabbalah [Jewish mysticism], as it spread eastward from Western Europe in the 12th and 13th centuries, did not make forms and images in the spirit of Kabbalah, apart from the magical amulets of practical Kabbalah. These sometimes bore an eye or hand composed of letters, biblical verses, or magical formulae. Both in prohibiting and permitting the figurative arts, Diaspora Jews displayed their receptiveness to the host culture. From Iran to the United States, and in every genre and medium from poetry to silver-smithing, Jewish artistic production bears the imprint of the surrounding culture. An exception is the Ashkenazic Jews who fled the Rhineland and Western Europe as the Crusades passed through on their way to the Holy Land. Some made their way south into Italy, but others moved east into the lands of the Slav and the Turkman tribes (the Khazars for example). These Jews found the new host culture inferior to what they had known in France and Germany. Shutting themselves off in the Rhineland German dialects which developed into Yiddish, for hundreds of years they absorbed nothing of the local civilization. It was not until the late 18th century and the rise of Hasidism that Slav influences in Eastern Europe are seen. From the 16th century on, we find both Ashkenazic and Sephardic Jews in Western Europe rendering the human form in paintings intended for the walls of private homes. In the 17th century we have murals on biblical episodes in Italian ghettoes and at this time numerous communities across Western and Northern Europe abandon their resistance to painting the human form. On tombs and tombstones in the Sephardic Jewish cemetery in Amsterdam are carved scenes from the Bible. In the 16th century Jewish artists were painting portraits; by the 17th century, rabbis were assenting to sit for these artists. From the 17th and 18th centuries there are Italian ketubot revealing the strong influence of Italian painting. In the 18th century we find illustrated versions of the Book of Esther being printed all over Europe, including one where Queen Vashti is portrayed as Marie Antoinette at the guillotine. Jewish artists such as Moses Ben Wolf of Trbischt, Wilhelm Unger from Poland, and Mauriczi from Galicia started making art their living in the late 18th and early 19th century. In the 18th century and early 19th we have Jewish painters of solid reputation in England (the Solomon brothers, for instance), while in the United States, Lawrence Cohen and Solomon Caravalho turn Charleston, South Carolina, into a center of Jewish art. Besides portraiture, Jews in this time period paint biblical scenes and patriotic subjects glorifying their adopted country. 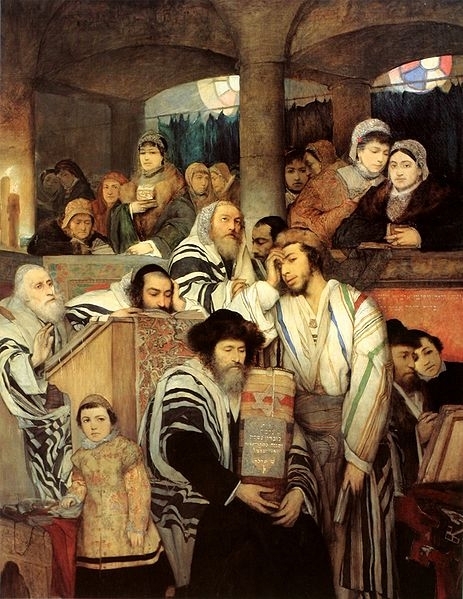 The assimilation of Jewish artists shows in their adoption of Western artistic styles and conventions while their Jewishness shows in the subjects they choose to paint. Ashkenazic painters from Eastern Europe embraced European art enthusiastically and it is from that region that the greatest Jewish artists of the modern period emerge to take up leading roles in the avant-garde movements that transform modern art. The ultra-Orthodox communities however, were less receptive to modern, secular art. Any painter or sculptor emerging in this society needed to leave for the centers of art in Western Europe and Americas in order to seriously pursue his or her work. The closing years of the 19th century finally freed Jewish artists from the obstacles that had hampered the full integration into the western art world, for up until that point, almost all commissions had come either form the church or the aristocracy. As the free market expanded, and the Impressionist revolution got under way, new possibilities opened up to Jewish artists. The Impressionists, aimed at rendering nature’s own form, rather than constrain it to some man-made ideal. Most Jewish artists, having just broken away from a sacred tradition and traditional way of life, found appeal in this individualism. Camille Pissarro, a Spanish Jew, was one of the key figures in the movement. He was joined by Max Lieberman in Germany, Lesser Uri in Pland, Izak Levitan in Russia, and William Rothenstein in England. Jews, like Soutine, Pasquin, Modiglianie, Epstein, Orloff, Zadkine, and Lifschitz played a significant role in the development of subsequent art genres. A new center of Jewish art emerged in Palestine-Israel with the founding of the Bezalel School of Arts and Crafts in the early years of the 20th century in Jerusalem. Situated among the new neighborhoods being built outside the walls of the Old City, the school, founded by Boris Schatz, court painter to the Bulgarian monarch, and Ze’ev Raban, is the first-ever Jewish school of art. By the end of the century it had become the Hebrew University’s Faculty of Art. At first the school’s founders and staff encouraged students (immigrants from Europe and the Middle East) to extend traditional Jewish art and crafts into original new works and to work on Jewish themes and subjects (for example, Abel Pan’s works on biblical subjects) in the hope of developing a unique Jewish “Land of Israel” style of art. By providing their students with a profitable and creative means of living, they saw themselves contributing to the secular Zionist drive to “productivize” the Jews–to make them productive and self-supporting in occupations such as agriculture and manufacturing. At the same time, they intended their work to help build up a new Jewish culture for the Land of Israel, based on the Zionist revival of Hebrew as the Jews’ language of speech and writing.